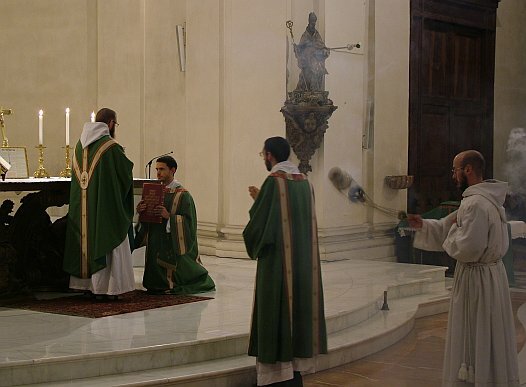 I was recently in Norcia, Italy, at the Monastery of St. Benedict, and had the opportunity to assist as deacon of a Solemn High Mass in the Extraordinary Form for the first time. 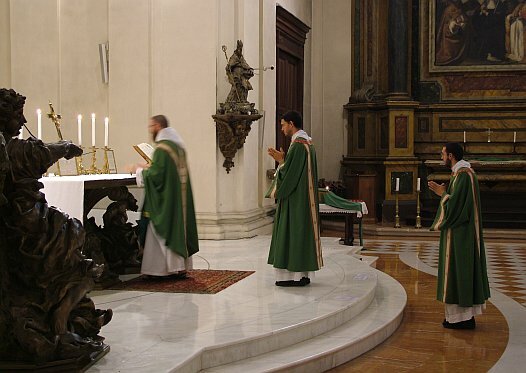 (I wrote a post two years ago when they received the apostolate from the Ecclesia Dei commission to celebrate the Holy Mass in both the ordinary and the extraordinary form. 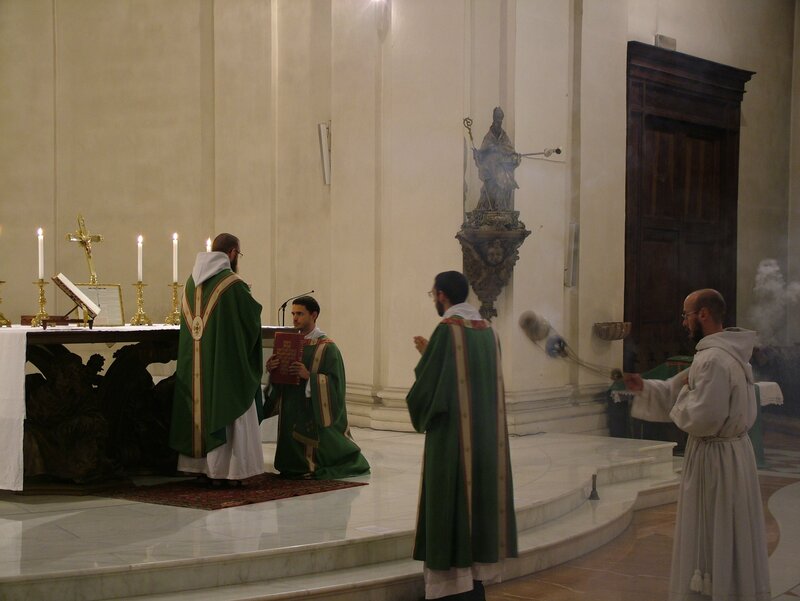 Their conventual Mass is now regularly celebrated in the extraordinary form.) 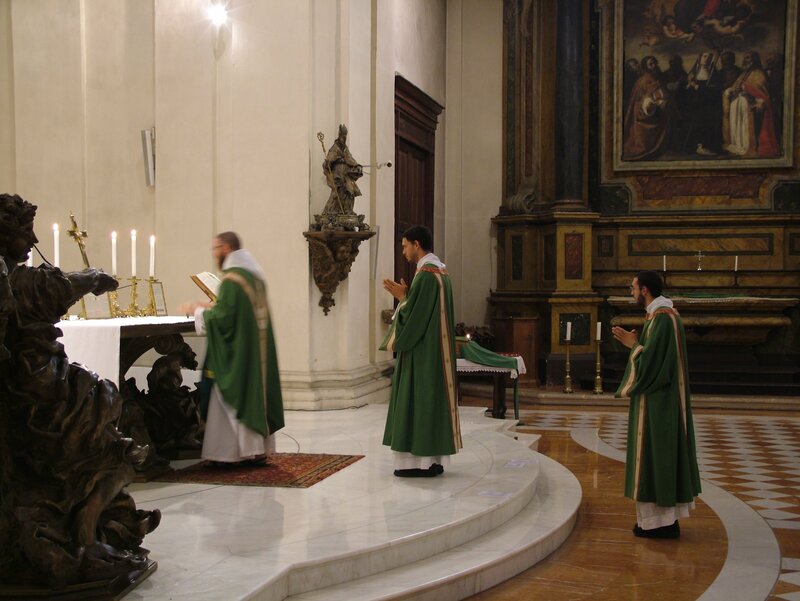 Here are couple of photos from a Mass where I and two of my brothers were the ministers. For those of my readers who are not subscribed to the feed, but come to this website itself, I wish to note that I will be unlikely to make any new posts until the end of August. The "Budget Control Act of 2011" (PDF of the bill; see also the Congressional Budget Office's Analysis of the Bill) passed by the house yesterday and by the senate today reminds me of Augustine's plea: "Make me chaste, but not yet". The plan makes conditions that entail a reduction of 2.1 trillion in the overall deficit of the next ten years — assuming that income from taxes remains as calculated, and that the interest rate for the US public debt does not rise. However, virtually none (merely 1%) of this reduction has to occur before 2013. Essentially, the plan is a promise to do something about the problem, but not yet… only after the next election. It is an attempt to satisfy voters with the promise to rectify the out-of-control debt of the USA, while avoiding the dissatisfaction that might follow upon the hardships possibly entailed in correcting the problem. The real situation is more like this: picture someone with $200,000 debt, paying 10% interest on it, and whose spending otherwise matches his income; he has to borrow an additional $20,000 this year to make the payments on his long-term debts, and is thus getting ever deeper and deeper into debt; next year he will have to borrow $21,000 to make the payments (assume half of his debt payments go to interest and half to principal), and over the next ten years will have to borrow $300,000 and be $150,000 deeper in debt. He decides he will take out a mortgage on his house to cover the payments for the next ten years, and will reduce his spending by $50,000 over the next 10 years. Now, instead of borrowing a total of $300,000 over the next 10 years, and getting $150,000 deeper into debt, he only has to borrow $250,000, and get only $100,000 deeper into debt. This is only slightly putting off the time when he can no longer make the payments on his debts, and is bankrupt. Despite the near uselessness of the budgeting of the Budget Control Act, there is a condition in it of potentially more real value, namely that the House of Representatives and Senate should vote before the year's end on a resolution proposing a "balanced budget amendment" to the Constitution of the United States. If such a meaningful amendment were to be made, it would be of far greater value than stop-gap measures like the budgeting of the Budget Control Act of 2011.